This is not your ordinary first aid course! This two day course was specially designed to address common traumatic and environmental injuries encountered by climbers and skiers. The curriculum was developed by extensively researching the nature of outdoor mountain injuries and realistically evaluating the information and techniques that could best serve the average recreational mountain or wilderness traveler. In 2006 we revised the course for a fifth time to integrate new material, based on participant responses and a program review. We feel it is now even better than it was before. We have also become a registered educational centre as part of ECSI. The "Emergency Care and Safety Institute" was formed by the American Academy of Orthopaedic Surgeons (AAOS) and American College of Emergency Physicians (ACEP). Now when students attend some of our courses we can offer CPR and AED add-ons at very little extra cost. In addition, we now provide excellent new training resources such as the the 4th edition of "Wilderness First Aid," co-sponsored by the AAOS and the Wilderness Medical Society at very low cost. 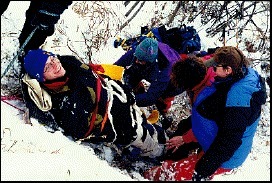 Plus the EMFA course now also gives you an ECSI certificate in Wilderness First Aid as a bonus! A very intensive weekend. Each participant leaves the course with most of the critical components of a proper mountain first aid kit. If you travel in the mountains it is only a matter of time before you need the knowledge provided by this course. An introductory letter containing further details for prospective course applicants can be viewed online. For the serious recreationalist, this is the essential next step. "OWLS" goes beyond the basics and prepares you for more complicated accidents by vastly increasing your understanding of the human body in injury and expanding your base skill set of responses to outdoor crisis. Since you respond best in situations you have dealt with before, OWLS pits you against a wide range of emotionally intense virtual accidents that provide bite sized portions of the "reality sandwich" that confronts you in accidents in the outdoors. The forty five hours of training provided in five days is perfect for Outdoor Ed teachers or trip leaders in organizations like Scouts, Guides, Venturers, Rangers, Rovers, JFWs, climbing clubs, hiking clubs and ski clubs who can't afford the time to attend advanced level courses. If you are responsible for others as a volunteer trip leader or head into the outdoors on multi-day trips, it may be foolish to go without the type of background that OWLS provides. Textbook and essential first aid materials to start your own OWLS first aid kit are provided. 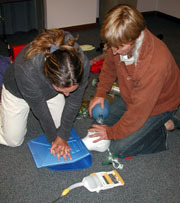 An ECSI Wilderness First Aid certificate is provided upon course completion. An introductory letter containing further details for prospective course applicants can be viewed online. The "Wilderness Emergency Care" course offered by Rescue Dynamics is the result of over two decades of development and evolution which merges advanced first aid and emergency care concerns from wilderness & urban environments. The course presents a balance between the ideal treatment modalities available in the "front country" and the bitter realities facing adventure seekers and guides in the "back country." Over a ten day period, 90 hours of theory and practical sessions combine to provide the essential foundation for dealing with traumatic, medical & environmental mergencies in the outdoors. This is the ideal course for guides, ski patrollers, outdoor pursuits instructors, rangers, wardens and anyone who works in the outdoors. WEC is ten days long and is taught in two five day blocks. The course is 90 hours of intensive classroom and practical sessions. Emphasis is placed on understanding HOW and WHY things happen and how to manage situations when away from advanced levels of care. There are lessons on most types of wilderness emergencies including climbing, diving, high altitude, heat, cold, avalanche related injuries, drowning, lightning, accident handling, first aid kits, medications, triage, long term problems, non-emergent problems and much more. Virtual accidents are still a big part of the course to give students a feel for accident management. WEC is recognized by the Association of Canadian Mountain Guides and meets the requirements set by many outdoor employers including rafting companies, Heli-ski and Cat Skiing companies and ski hills. Certification is valid for three years. Course Content: Trip Planning & Accident Prevention, Wilderness Accident Management, Basic Anatomy, Body Substance Isolation, Body Surveys & Vital Signs, Records, History Taking, Respiratory & Circulatory System, Chest Injuries, Oxygen Administration & Suction, Artificial Ventilation & CPR, Bleeding, Soft Tissue Injuries, Dressing & Bandaging, Shock, Musculo-Skeletal System, Lifting & Moving, Orthopedic Injuries, (Pelvis, Upper & Lower Extremity Injuries), Central Nervous System, Injuries of the Spine, Skull & Brain, Eyes, Ears, Nose & Throat, Abdomen & Digestive System, Injuries to the Abdomen & Acute Abdomen, Gastro-Intestinal & Genito-Urinary, Triage, Patient Positioning, Improvisation Techniques, Cardiac Emergencies, Cerebro Vascular Accidents, Pulmonary Disorders & Asthma, Diabetes, Hypothermia, Frostbite, Heat Emergencies, Burns & UV Injuries, Lightning & Electrical Injuries, Hazardous Materials, Drowning & Near Drowning, Wilderness Patient Transportation, Avalanche & Climbing Related Injuries, Medical Problems at Altitude, Poisons, Allergies, Stings & Bites, Helicopters & Aircraft, Non-Emergent Problems, Medications, Legal, First Aid Kits, Emergency Communications, Prolonged Backcountry Care, Virtual Accidents. EFR or "Emergency First Response" is a CPR, AED and First Aid training agency that is a corporate affiliate of PADI (Professional Association of Dive Instructors). Their programs closely follow the PADI model of self-directed study. Students are required to do pre-course homework and watch a course DVD prior to attending the actual instructor - led segments of the course. As such, the motivated learner can more easily fit EFR fiirst aid and CPR courses into an active lifestyle. In addition the EFR courses fit well as a basic first aid course for divers looking to proceed into a Rescue Diver course.. The EFR Primary and Secondary Care courses meet the prerequistes for entry into Rescue Diver training. In the past Rescue Dynamics has had many courses for which CPR and/or AED were prerequisites. Through partnerships with agencies such as ECSI, EFR, CHSF and others we now offer CPR, AED and Oxygen Administration add-ons to most of our programs such as EMFA, OWLS, WEC and PER. CPR has undergone a dramatic evolution (some would say revolution) in December 2010 to make it more effective and easier to learn for the lay person. Integrated into most of our CPR courses is the use of automated external defibrillators, which have been made so simple that even an elementary school child could save a life with an AED. AEDs are not just in the back of the ambulance any more. AEDs are now everywhere; in airports, at ski hills, at heli-ski operations, at cat-ski operations, at large restaurants, at golf courses, in shopping malls, in aircraft and many more places. Inexpensive and easy to operate models are now in the homes of many individuals who are known to be at risk from cardiac arrest. With the new CPR standards being such a change and with new important material being included, you should consider renewing your CPR if you have not taken a course in 2011 or later. If you don't know 30 and 2, you should renew. A full CPR / AED course is now typically only about 5 - 6 hours long. A refresher is typically 4 hours long. Be sure you notify your instructor before a course begins if you want any additional skills to be added to the program that are not already listed in the course outline. To add CPR, AED or Oxygen therapy requires additional training time with associated cost. In addition, there are supplementary texts which must be sent out for required pre-reading before these courses begin. We can also offer CPR & AED as stand alone courses. We do not schedule CPR or AED courses but if you want a private course for you or your group we would be happy to provide one. Other Courses: Custom courses up to and including the EMT level can be arranged. Courses can be taught across the country if required.